Feb. 23 – Two quick-thinking convenience store employees were honored Thursday by Cornelius Chief of Police Bence Hoyle for chasing a suspected robber who allegedly stole money from the store’s register on Jan. 17. 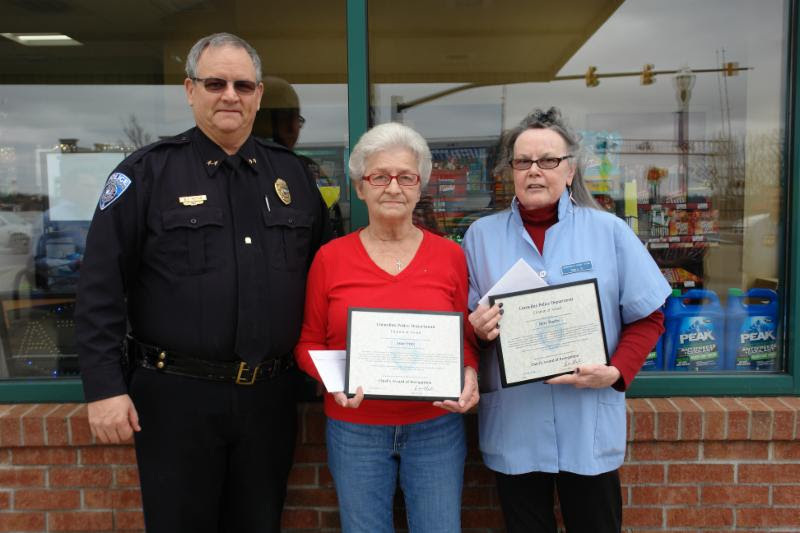 Hoyle awarded Cashion’s Quik Stop employees Anne Price and Mary Sharris with the Chief’s Award of Recognition and $125 each as a monetary reward from North Mecklenburg Crime Stoppers on Feb. 22 for their actions during the robbery last month. On January 17th around 12:35 p.m., Price and Sharris were working inside Cashion’s Quik Stop on S. Main Street in Cornelius when, according to police, suspect Harold Lee McCoy asked for change for a dollar. Police said McCoy then allegedly grabbed money from the cash register when the drawer was opened by one of the employees. McCoy fled the store, but Price and Sharris, who police said were pushed out of the way and suffered minor injuries during the incident, chased after him and obtained a partial license plate and description of McCoy’s rental car. Thanks to the women’s descriptions, the police were able to locate McCoy at a Huntersville residence within five hours, police said. McCoy, a 42-year old white male, was charged with felony common law robbery, according to police. McCoy was also wanted on two felony warrants from Iredell County for larceny from the person and being a habitual felon.